This is the twenty-first in a series of guests posts that feature Archtober Building of the Day tours! 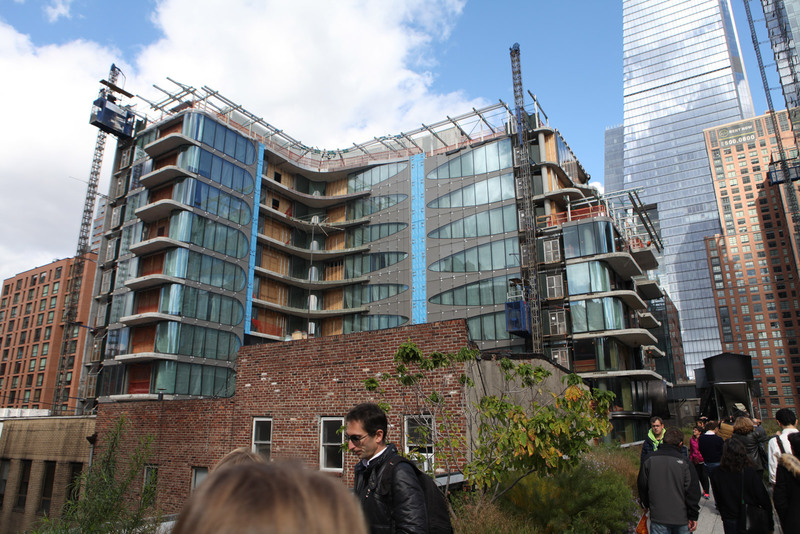 The architecture buffs of Archtober got a special hard-hat tour this afternoon of one of New York’s most highly anticipated new constructions: 520 West 28th Street. The project is the first building in the city by the late Zaha Hadid, the renowned Iraqi-British architect who passed away last spring (The Real Deal recently reported that the Moinian Group has filed plans for a second Zaha project in Chelsea). 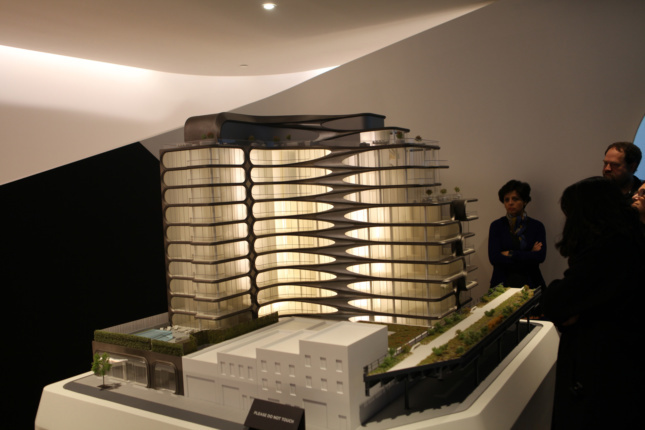 For this luxury residential property along the High Line, developer The Related Companies and the design team at Zaha Hadid Architects (ZHA) are carrying out her legacy. Our tour began at the project’s sales gallery at West 25th Street—a small but comprehensive showroom that defines the brand of the building’s interior: bright, white, simple, and striking. 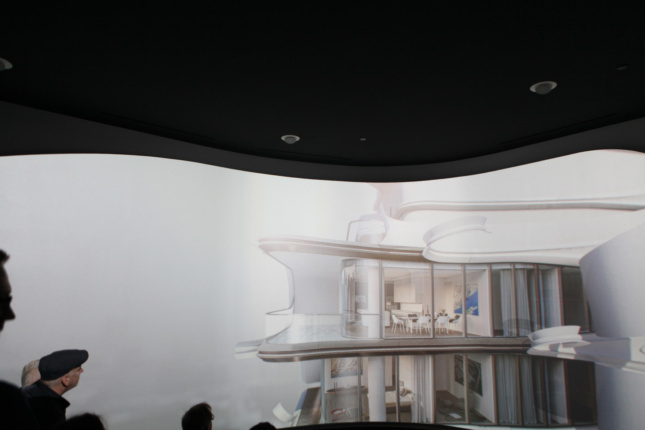 Tour-goers were introduced to the project by a video narrated by Hadid herself. We learned about the multiple upscale amenities the building has to offer that make up this “distinctly curated lifestyle.” We were shown stunning renderings of the soon-to-be constructed 75-foot sky-lit pool, the private spa suite, the private IMAX theater, the fitness center, the robotic parking portal, and the lobby with 16-foot ceilings and a sculptural “moonscape” wall. Hadid’s projects around the world are often characterized by the graceful curves and nature-inspired organic forms she infuses into her designs. This curvy condo is no exception. Even the interior showroom, representing a single unit’s living room and master bathroom, was full of sweeping lines and exhibited seamless flow throughout the space. 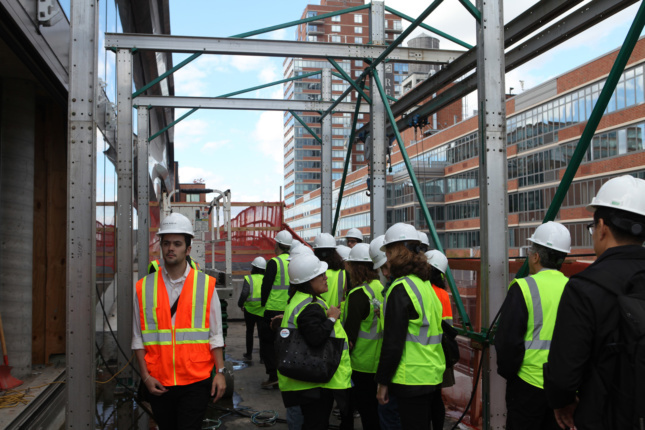 After studying the detailed interior, we put on construction vests and customized ZHA hard hats to tour the L-shaped construction site. The flat façade on 28th Street was already complete, and we could view the futuristic chevron pattern that covers the entire building. Walking into the lobby, it was hard to imagine the visionary, light-filled spaces that would eventually replace the current construction. But ZHA’s Filipe Pereira explained the nuances of the coming design that would make it feel like a Zaha rendering come to life. In fact, once next to the project, it felt as if the construction had magically gone up exactly as she’d designed it. This building may look like an out of this world as a rendering, but it feels very authentic as a singular, physical piece of architecture. No unit is like another, so every buyer is getting a unique work of art. Our final stop on the tour was on the 16th floor of the 18-story structure in unit 32, a split-level, four-bedroom condominium and among the most expensive of the building’s 39 units. Here we were able to best understand what it will be like to own and live in one of these spaces. 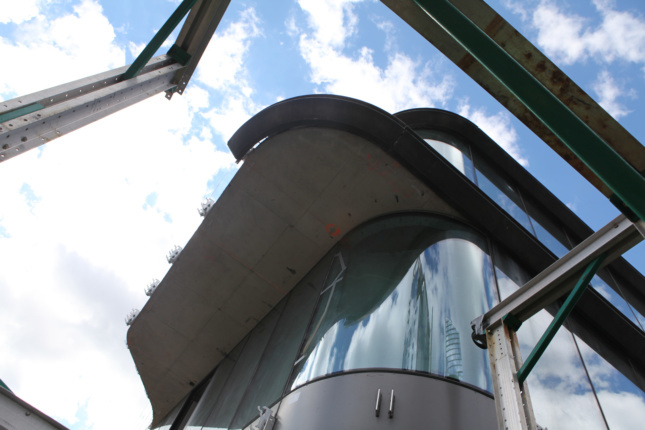 We lingered on the balcony, talking about the non-distorting window glass and watching the construction workers prepare to put pieces of the hand-rubbed stainless steel façade in place. We also gawked at the views of the High Line and the distant Empire State Building while trying to capture the best angles of the building on our smartphones. And up there, it became clear, as Pereira pointed out at the tour’s start, that this beautiful, immaculate façade—and building as a whole—won’t be done again. Tomorrow, we visit the brutalist Met Breuer!